Mae Ping national park covers Doi Tao district of Chiang Mai province, Li district of Lamphun province and Sam Ngao district of Tak province. It is a fertile forest with lot of plants and animals. Its 1,003 square kilometers area contains the rugged mountain ranges and rivers. The northern parts of Bhumipol dam are popular places for recreation. It is generally steep mountain range with average height of 900 meters above sea level. The hills are the sources of head waters for the streams flowing into Mae Ping river. In Doi Tao (Chiang Mai province) Mae Ping river is dammed to become a lake. The spill water then continues flowing south to Bhumipol reservoir in Sam Ngao of Tak province (100 km south of Doi Tao lake). The widest point, which is about 6 km wide, of the Ping river between the 2 reservoirs is called "Bo Lom" and "Huay Phra Bat". Approximately 80% of the park's total area is shading-leaves forest especially on the hills less than 1,000 meters elevation above the sea. The other 20% is mainly moist evergreen forest. Teak, Shorea obtusa, Shorea siamensis, Dipterocarpus macrocarpus are found as dominant trees. Wild life found in the park are barking deer, banteng, wild pig, serow, gallus gallus, goral, fishing cat, asiatic black beer, small indian civet, macaque, langur and gibbon, and birds and fishes. From Lam Phun take the highway no. 106 to the south for about 80 km to a small town called "Li". From there take the highway no. 1087 (Li - Ko). Between km marks 20 and 21 you will see the park's headquarters. By river the park can be reached from either Doi Tao reservoir (sailing downstream on Mae Ping river) or from Bhumiphon dam (sailing upstream on Mae Ping river). Mae Ping national park provides bungalows at the headquarters and floating raft houses at Kaeng Kor lake ranger station. 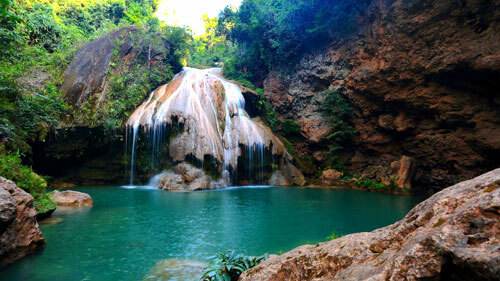 Mae Ping national park is known as one of the most beautiful parks in Thailand. The interesting features include caves, waterfall, grassland, river routes and viewpoints. Camping: The peaceful and pleasant climate of the forest made this activity popular among the visitors. Bird watching: Due to its broad altitudes, high elevation and cool climate, the park supports a large number of bird species. River trip: During the trip, you will be impressed by the beautiful scenes of mountains and cliffs dotted with wild flowers and plants along the river. Trekking: Visitors can hike through the fertile forest and do study on wildlife and plants. There are many interesting spots such as waterfalls, caves, lakes, grassland, view points in the park.